There may be some who deny handmade jewelry a place at the Fine Art table, but rings are often the most cherished of objects, and the history of designing adornments for the human body goes back almost as far as visual art. Emily Maynard creates jewelry that takes full account of that rich and varied history. Maynard quickly discovered a passion for the history of jewelry in her graduate work at The Bard Graduate Center: Decorative Arts, Design History, and Material Culture in New York City. Her Masters thesis explored the relationship between Italian Renaissance and ancient Greek and Roman jewelry, which inspired a semester at the Jewelry Arts Institute in Manhattan. She founded Elva Fields Jewelry in 2003, and the company’s aesthetic blends that historical context with a highly personal framework for her designs. There are three lines: Elva, June, and Deb—which are named for the artist’s great-grandmother, grandmother, and mother, respectively. Maynard exhaustively collects materials and repurposes them into fresh, new configurations that carry the associations of the past, the details and feelings from historical period, into their new life. The fullness of what is seen here, separated from the scale of the human form, reflects a sculptural quality that connotes weight and gravitas, yet the materials, such as antique Nigerian glass beads in “Everything’s Changing”, are never repressive in their effect. Instead, there is here a spiritual quality present that echoes the culture of origin. 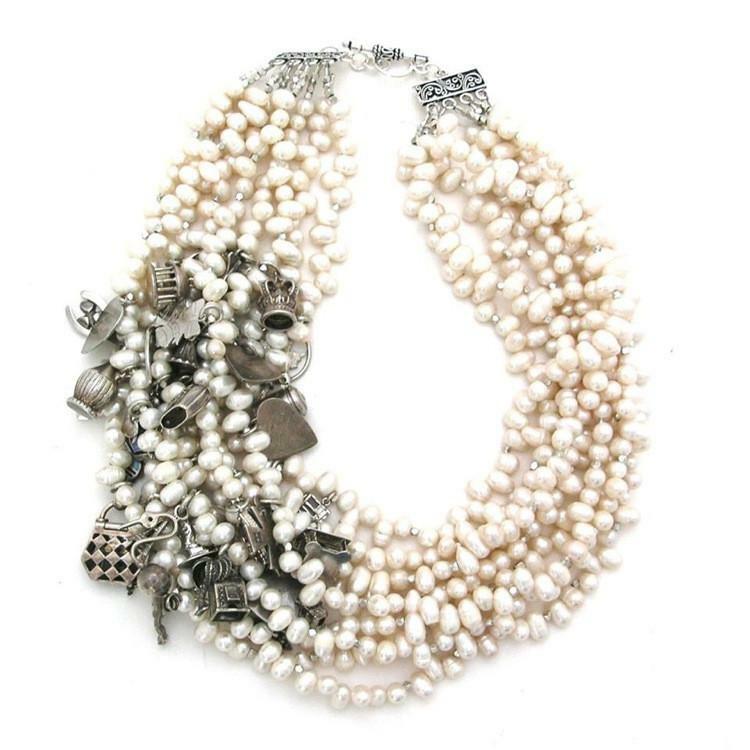 In another example, a customer's collection of vintage charms from her grandmother's and mother's charm bracelets is incorporated into a classic arrangement of pearls that harkens back to late 19th century jewelry. The Little Ladies series of necklaces are made by hand in Maynard’s studio using vintage trim (here a kelly green fringe) and an assortment of beads from our collection. This necklace pays it forward by supporting underprivileged youth in Louisville, with a portion of proceeds providing materials for kids to create a similar necklace in monthly classes taught by Elva Fields artisans at The Cabbage Patch in Old Louisville. Emily Maynard will be participating in the 2017 Open Studio Weekend, sponsored by Louisville Visual Art and University of Louisville’s Hite Art Institute. Her studio in the Clifton neighborhood will be open the weekend of November 4 and 5. Tickets for Open Studio Weekend will go on sale October 16. Click here for more information. Gallery Representation: PYRO Gallery (Louisville).